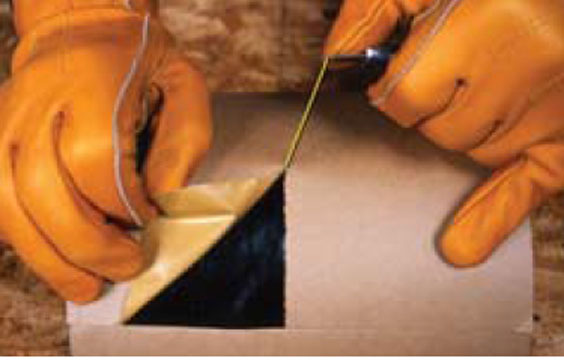 Vycor® V40, a high performance, self-adhered flashing membrane provides premium protection against water infiltration in all critical non-roof detail areas, which traditional building papers, felts and housewraps cannot match. 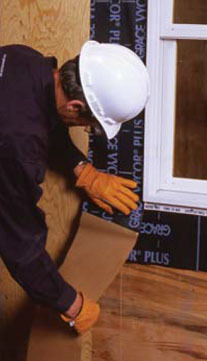 When properly installed, Vycor V40 can reduce the risk of water infiltration, often associated with costly call-backs. Vycor V40 fully adheres to the substrate, seals around fasteners and prevents water from passing through and into the structure. It is highly conformable, easy to detail and provides premium protection against leaks. Best of all, Vycor V40 employs the same proven technology as our famous Ice &Water Shield®—the market leader for over thirty years. Vycor V40 self-adhered flashing is composed of two waterproofing materials—rubberized asphalt and cross-laminated polyethylene. Vycor V40 is available in a range of widths: 6 in., 9 in., 12 in. and 18 in. (150 mm, 225 mm,300 mm and 455 mm) to accommodate a variety of job requirements.